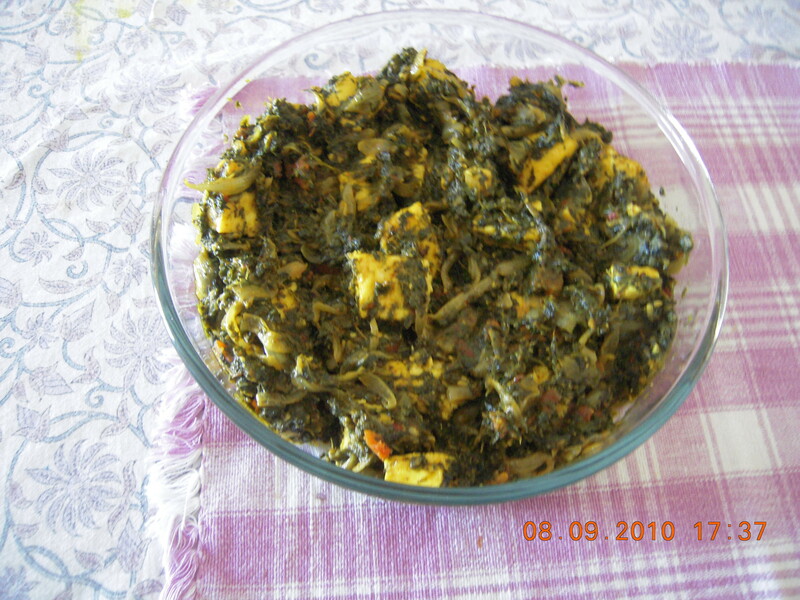 The addition of paneer to palak masala creates this more elaborate dish. This is one of Noor’s favorite subzis – she loves to eat it with phulka and lots of yogurt to mix in to the spinach- and this is what we had for dinner tonight, with some daal and carrot salad on the side. I usually make a little more than we need of the spinach and the daal, as the leftovers are great for kneading the dough for the next day’s phulkas. Defrost the spinach leaves. When they are at room temperature chop them fine in a food processor. In a large frying pan, heat the oil, then add the cardamom pods. When their aroma starts to spread, add the onions and fry till they start to go from a golden brown to a darker brown – but not longer than that. Add the ginger and garlic pastes, fry for a couple of minutes, then add the tomatoes (or pulp). Fry this mixture till the oil starts to appear on the sides. Add all the dry spices next and fry for a minute. Add the pieces of paneer and fry for a minute to coat them well. Add the spinach now, season with salt, and cook, covered, till it is soft enough. A minute before you take the pan off the fire , add the ghee and mix it in. Shri loves this potato curry – he calls it aloo shak, which is probably an Indori name for it since he talks fondly of having eaten this many times in the sarafa bazaar of Indore – with puris and if he had his way this is what I would make each time we have friends over for a meal. Yesterday, for dinner with Vishal and Shefali’s family, we had this curry with palak puris. And it was so pleasing to see Twisha and Vayun enjoy the carrot salad I had made to go with the aloo-puri as much as Shri, Indira and Noor do. Leave the tomatoes in very hot water – freshly boiled – till their skin comes off easily. Then drain and leave aside to cool. In the meanwhile cook the potatoes, till they are soft, in a pressure cooker. When the cooker has cooled a bit, open the lid, drain the water, take out the potatoes in a colander and leave aside to dry and cool. Peel and chop the tomatoes in to very fine pieces. When the potatoes are cold, peel them and dice them in to small pieces. In a large frying pan, heat the oil and put in the red chili, the mustard seeds and the nigella seeds. When the mustard seeds begin to pop, add the fennel seeds, fry for a couple of seconds, then add the garlic and fry for a few seconds till the garlic loses it’s raw look. Now add the cumin seeds and fenugreek seeds and fry for just another couple of seconds else the fenugreek seeds can burn and will develop a bitter taste. Add the tomatoes next and cook on medium heat till their juice starts to dry up. Then add all the dry spices and fry for a minute or so, till the oil starts to appear on the sides of the mixture. Now stir in the kasoori methi and fry for another few seconds. Add the potatoes, along with salt. Fry for a few minutes till the potatoes are well-coated with the tomato mixture. Then add about 2 cups of water and simmer the curry for a while till the gravy is as thick as you like (add more water if needed). Once way to ensure the curry is well-done is to let it simmer, stirring occasionally, till the surface starts to acquire a rich red color/glaze. Garnish with green coriander , if you haven’t used kasoori methi. We had this for dinner last night, with khichdi. This dish is so easy to make but it has simple, delicious flavors. My recipe for this dish is an adaptation of the classical version, since I make it from the faint memory I have from a long-ago time in Nagpur, when I saw a Tamilian friend’s wife cook it. The first of those names is what this dish was called in my parents’ home; but since saag is not a term a lot of people seem to know readily, I thought I’d like to call it the other two as well, since the base for this dish does come from the fairly standard onion-tomato-garlic-ginger-dry spices masala which is common to many curries. I remember the first time Indira exclaimed “I really like palak !” though both she and Noor have always eaten it without any fuss. 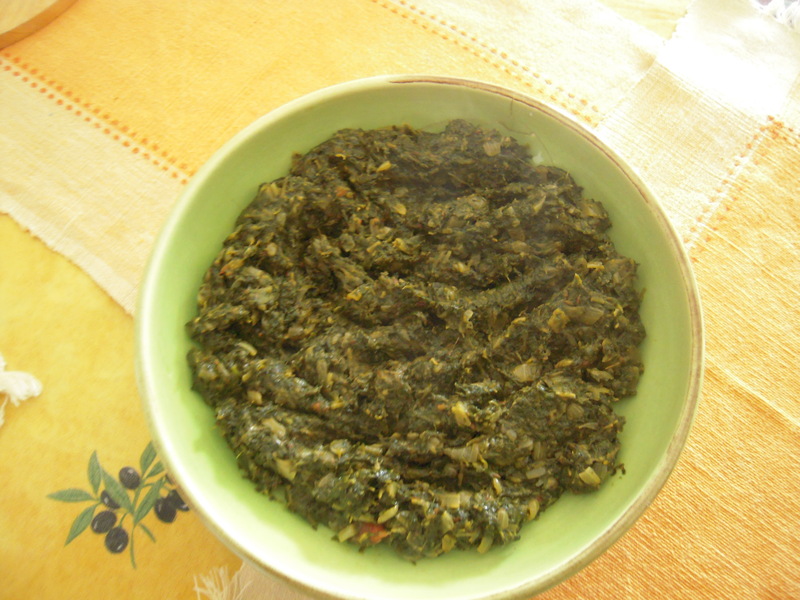 Especially if one uses frozen spinach, this can be a quick and easy subzi to make. I once passed off – successfully so – this very Indian subzi as a salad. Either way, it is really fresh and light and just great to eat in the summer. And while it does take some time to dice the beans, the cooking part is so easy that it makes up for the longer prep time. I love to eat it with sambhar and rice, or with phulkas and yoghurt. Or just mixed in to plain, hot rice, as Indira likes it too. 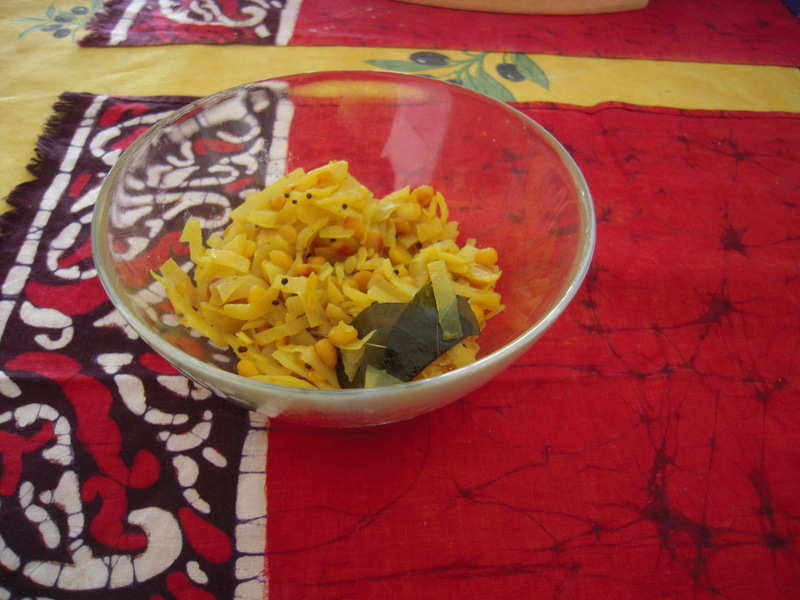 The recipe here is based on my memory of eating it in the homes of Tamilian friends and of watching one of them cook a similar dish once with very finely sliced cabbage. I believe vegetables cooked in this way are called poriyals. In a frying pan, heat the oil to a moderate temperature, then add the asofetida and the mustard seeds and fry till the seeds start to crackle and pop. Add the curry leaves and the red chili and fry for a few seconds. Now add the beans and mix well with the other ingredients. Cook uncovered for 3-4 minutes, turning over the beans a couple of times, then add 1/4 of a cup of water -maybe a little less, maybe a little more, depending on how fresh and soft or tough the beans are – and salt. Cover the pan and cook the beans on a moderate heat till they are tender. Towards the end, mix in the coriander powder. Just before you take the pan off the burner, add the grated coconut and mix well. When I am using dal, I soaked it for about an hour or two (I forgot to soak it today so decided to skip it) then drain it thoroughly. I add it after the curry leaves, and fry it till it turns a very light brown color and acquires quite a soft but still crunchy texture. After this, it cooks with the beans and is soft enough to eat by the time the beans are done. This is another tout simple dish to make . And if you don’t count the coconut you could always use less, though along with the chana dal it is really what makes this dish the treat that it is – it has fairly little oil which is a plus too. Cauliflower is a vegetable I end up cooking quite often. 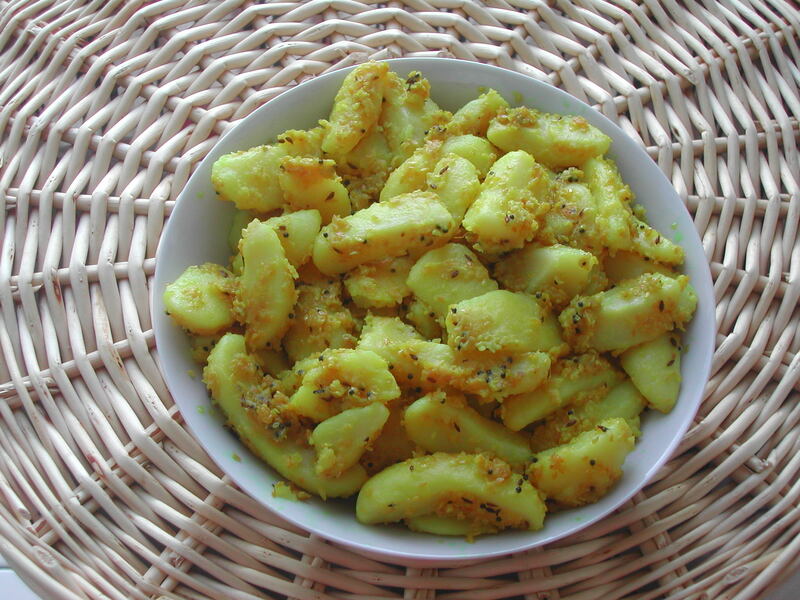 It is one of Shri’s favorite vegetables, and one can make it in so many different ways that are all simple and quick. The way I like it best is with the spice mixture I love – paanch phoran – and a little tomato. This gives the subzi a slightly tangy and vaguely achari taste because of which I love to eat it with paranthas, or with the simple combination of varan and plain rice, and that is how we had it yesterday for dinner. Divide the cauliflower in to florets, then slice each of these in to 2-3 pieces, taking care that these are neither so big that they won’t cook easily,nor so fine that they’ll end up all mushy/smashed up after cooking. Heat the oil in a large frying pan, and add the 5 types of seeds (i.e. the paanch phoron) in the sequence I have suggested here . Now add the cauliflower pieces, and turn over once to coat thoroughly with oil. Cover the pan, and cook the vegetable for some time on medium heat, turning every few minutes so that the pieces don’t burn. When the vegetable seems half-done, add the tomato, the turmeric and the red chilli powder, and turn all the pieces to coat them well with the tomato and the spices. Cover the pan again and cook for some more time, turning the pieces over once in a while till the tomatoes are quite soft and the vegetable is almost cooked. Now add the salt and the coriander powder, cover again, and cook for a few more minutes till the cauliflower pieces are done. Chopped,fresh coriander adds a nice look and flavor to this dish. Indira and Noor relish eating this subzi with plain yoghurt and phulkas. Having just documented one of Indira’s favored foods, I feel this urge to be fair and record one of my younger baccha Noor’s favorites too, before I log off for the day. Actually, we owe their Nanda Mami a big thank you for introducing us to this amazingly simple, but delicious food when she stayed with us for a few days 3 years ago. It is very versatile, too. I make this for us to eat with leftover-daal paranthas and raita, or sometimes as part of a first course, to go with a very french salad, when dinner is a more formal affair with guests at home. And since I am always looking for ways to up the nutrition quotient- the til (sesame) delivers in that department. A real winner in every way, then ! Boil and peel the potatoes. You can try and save time by by trying to find the pre-boiled,peeled baby potatoes available in some places. In a frying pan, heat the oil (don’t wait till it starts to smoke, though) and add the mustard seeds. When they start to splutter, add the cumin seeds and as soon as these turns a darker brown (which releases their aroma) add the sesame seeds. Do take care not to let the cumin go black – IMO this neither looks nor tastes good . Stir the sesame seeds periodically till they start to go a light brown, then add the turmeric, the potatoes, the salt, and toss everything together once. Remember not to let the sesame go too brown. This can make the taste almost bitter. Continue to turn the potatoes from time to time, over the next 5-7 minutes. Now add the lemon juice and cook the potatoes in this juice for another 5-7 minutes, till they liquid is all absorbed. Take off the heat, and toss in some fresh, chopped coriander if you like. This dish tastes best if it is prepared a couple of hours ahead of the meal, because this allows time for the ptatoes to really absorb the flavors. For a “hot” flavor, you could add some chopped green chillies (to taste) along with the mustard and cumin. Anyway you make it, this dish tastes great !